In today’s post I will be sharing quick tips on how to find the best suits for your body type. We are midway through summer and retailers have begun slashing prices on quality swimwear, so I figured this was the best time to share this information. Thanks to Asian sites you can now buy swimsuits for like 99 cents, however, weve all heard the saying you get what you pay for #toogoodtobetrue. Which is why I suggest that as a full figured / plus size woman you take advantage of the sale season and my tips now and get the most value for your money. Finding the best swimsuit for your body type requires you to know what your body type is, do you? it’s one of the fundamental requirements for dressing better. For pear shapes look to attract the eye upwards so plunge necklines, ruffles around the decolletage (like this one for only $16), off shoulder pieces are the way to go. Make sure to also go for bottoms that are full coverage in the back with little to no frills and embellishments. You can go with both a one or two piece. For donut shapes, one piece’s are your best friends look for details that deemphasize your belly like color blocking, dark panels and ruching on the sides (like this suit). Next for inverted triangles stay away from cuts that emphasize the broadness of your shoulders, like halter tops or Crop tops. Your shape can be tricky depending on wear you hold the most weight. 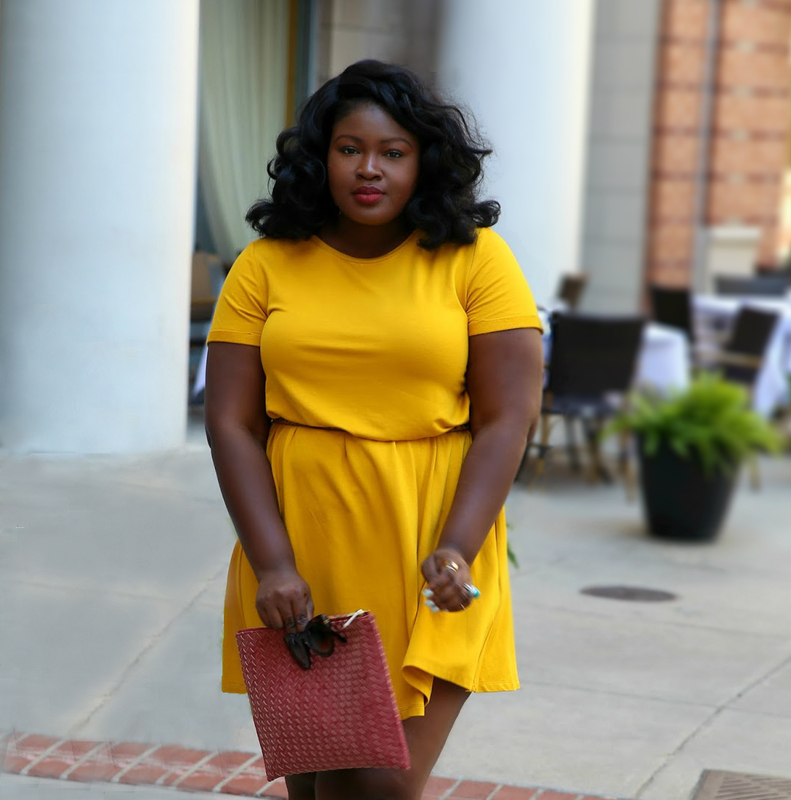 Go for prints, bold colors, ruffles and ties on the bottom to draw attention downwards ( only if your belly isnt an issue).Try a wrap silhouette, strategic paneling or cutouts around the waist to bring the eye in (like this crochet suit). Also higher cuts may emphasize long shapely legs. My suit is from Eloquii its sadly sold out. However, if you like the print you can buy this Bikini top (on sale) size up unless you are pear shaped. 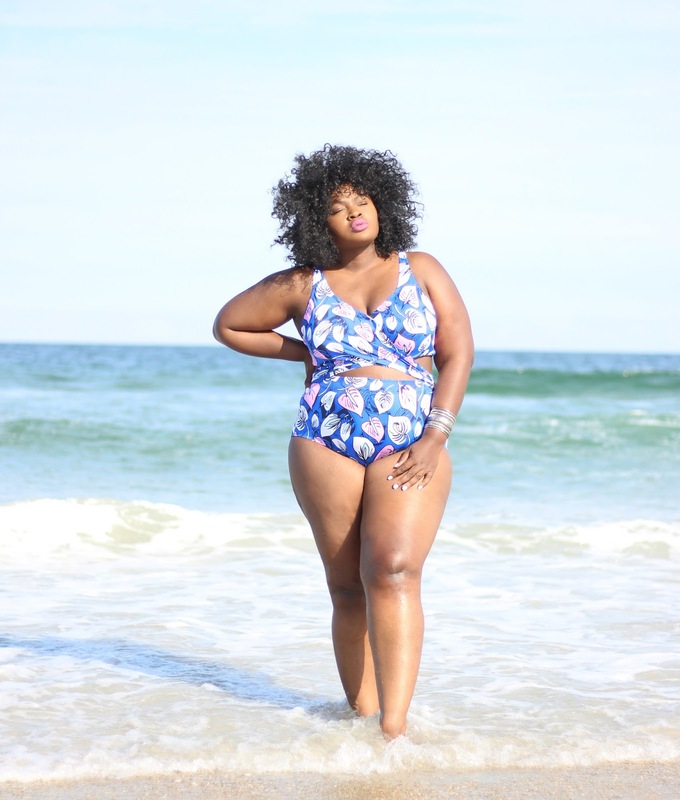 Lastly, no matter what shape you are, when you are plus size always look for suits that are made from heavy duty swim fabrics that will help gently shape you, as well as for thicker straps, fastens and underwire. These tend to be premium features that will cost a bit more, however, these added features will help you look your absolute best in your swimsuit. So take advantages of the sales happening now and shop my picks now before they are gone. P.S. no one is perfect, its a myth and those hangups that you have, trust me no one else is/will be as hung up on them as you, so go live your best life and slay in your suit.If $$ on swim is just not in your budget then watch the video for the best swim options under $15. Investing in swimsuits (for features like underwire and power mesh fabric) is still my recommendation, however, I understand it may not be in everyone’s budget so I hope the video below helps.